Oarfish are large, greatly elongated, pelagic lampriform fish belonging to the small family Regalecidae. Found in all temperate to tropical oceans yet rarely seen, the oarfish family contains four species in two genera. 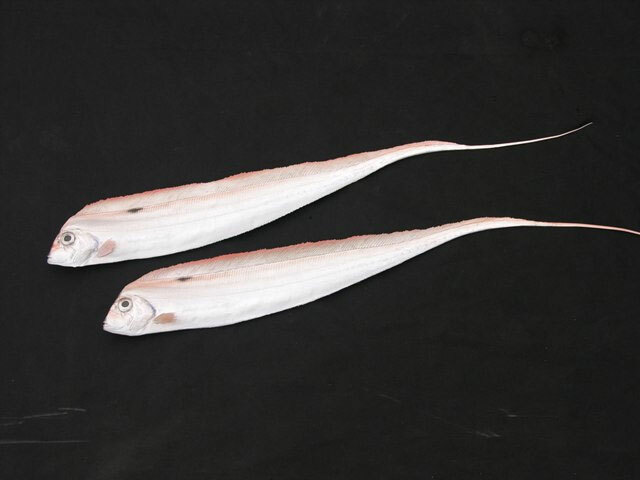 One of these, the giant oarfish (Regalecus glesne), is the longest bony fish alive, growing to up to 36 ft (11 m) in length. That is not enough to qualify as the longest fish, however, as some of the cartilaginous fish such as the basking shark and whale shark are even longer. The common name oarfish is thought to be in reference either to their highly compressed and elongated bodies or to the now discredited belief that the fish “row” themselves through the water with their pelvic fins. The family name Regalecidae is derived from the Latin regalis, meaning “royal”. The occasional beachings of oarfish after storms, and their habit of lingering at the surface when sick or dying, make oarfish a probable source of many sea serpent tales. Although the larger species are considered game fish and are fished commercially to a minor extent, oarfish are rarely caught alive; their flesh is not well regarded due to its gelatinous consistency.